- You want to buy cigars, even though you don't smoke, just for the feeling. - You know an SW quote for every situation. - When you arrive with the train and somebody is waiting for you, you ask: "And Frank?" - You desperately want to learn to play the harmonica. 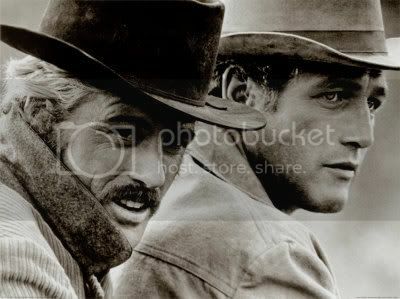 - You practise the "Fonda walking style"
- When a Typical SW Supporting Actor shows up, you can tell his name and his other roles and how many times he bit the dust in other movies. Sorry if my English isn't very good... I'm learning! You choreograph the act of swatting a fly to Morricone. You buy a book of photographs of Italian actors and actresses just because there's one photo from OUATITW and one from FFDM. You watch "Im Reiche des silberen Löwen", knowing it was shot in Spain, looking out for locations you know. You know certain places in Spain without ever having set foot on Spanish soil. Oh, and you watch the forementioned, noting to yourself "That's supposed to be Abu Seif, but it's Esteban Rojo in fact." And you know you're the biggest lazer on the Earth when you don't learn it, even though you've got three harmonicas and a booklet of how to do it, complete with a CD. Eventually you want to make at least one of each type. -When your friends have no idea what you're talking about when you say "Ya know Wobbles? I'm kinda mad at you..."
-When half your internet dwelling time involves looking up clips of SWs on youtube. -When you find cowboy hats incredibly hot. -When you make friends across the globe simply over your shared interest in the genre!! "I have vision, and the rest of the world wears bifocals.."
Hmmmm, I've named my German Shepherd dog "Tuco", so now I am not sure wheter or not I am obsessed with SWs. Having named our cat Bisha, I'm not sure what to think... Although, that was four or five years ago, at that time I wasn't obsessed with SW's yet. Although... I named the current kittens Yksi and Kaksi. But that was in cooperation with my sister, who's not SW obsessed. Reminds me of how I wanted to put Clint Eastwood's head on my roommate's picture torn from a magazine. Hehe. I see a trend in my made up stories, of putting cowboy hats on the heads of characters who are not Western characters. - When you consider Back to the Future III the best one just because of its homages. psshhh not surprising from you at all, my good western fan comrad. Guess what FC wanted to name Jackie? I thought the same. Why not Jill? Jill's a fairly common name... no one would ask why i named my dog Jill, whereas if I named it Django.. they'd be like "Whoa! Cool name!!" and would probably think it was named after the musician.